United Overseas Bank (UOB) has forged a scholarship with Singapore Management University (SMU) to build up Singapore’s talent pipeline and equip them with data skillsets. The initiative is part of efforts to prepare for the increasingly critical role data plays in driving informed business decisions and strategies for organisations. 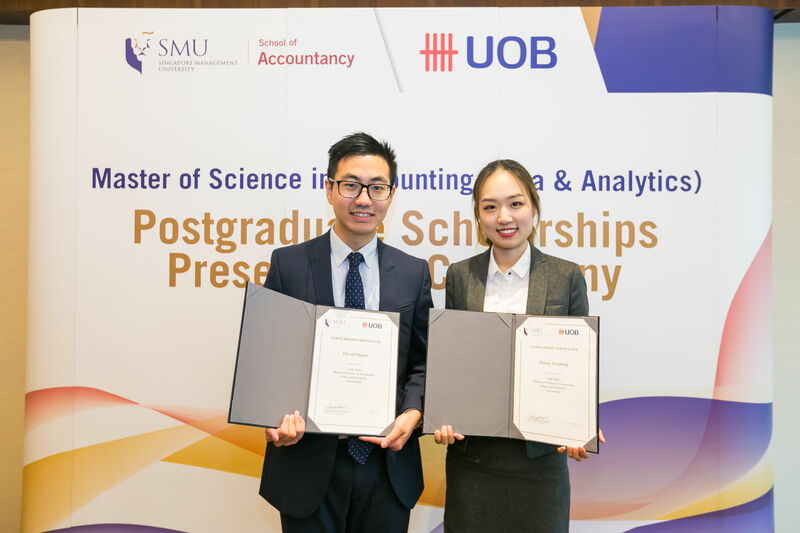 The inaugural UOB-SMU’s Master of Science in Accounting (MSA) scholarship has been awarded to two enterprising students in the SMU’s MSA (Data and Analytics) programme. SMU students David Djapri and Zhang Tongtong were selected as the first two recipients of the scholarship, having achieved outstanding academic results. They will undergo the MSA programme without worrying about funding, and will also be able to deepen their skills and expertise through a 12-week internship programme at UOB. “At UOB, we are committed to developing the skillsets needed to succeed in the digital economy. The UOB-SMU MSA Scholarship is one way in which we can help spur higher learning in the area of data and analytics – something that is vital in our data-driven and interconnected world,” Richard Lowe, Chief Data Officer, UOB, said. “We are grateful to receive UOB’s support for two of our best students with this scholarship and for their recognition of the value of our MSA programme not only to its students but, through them, to the financial sector as a whole,” said Cheng Qiang, the dean of SMU’s School of Accountancy. “Armed with the knowledge of machine learning and data analytics, our graduates will be better equipped to bring value to their workplaces, from banks and audit firms to technology companies,” he added.